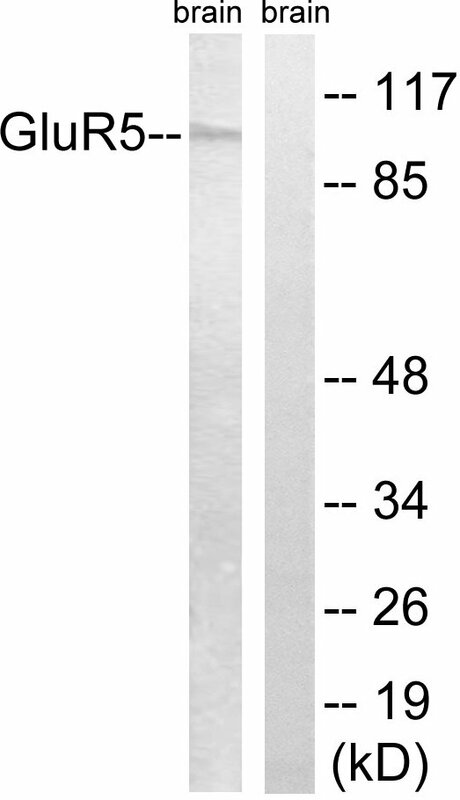 GluR5 Antibody detects endogenous levels of total GluR5 protein. The antiserum was produced against synthesized peptide derived from human GluR5. Small volumes of anti-GluR5 antibody vial(s) may occasionally become entrapped in the seal of the product vial during shipment and storage. If necessary, briefly centrifuge the vial on a tabletop centrifuge to dislodge any liquid in the container`s cap. Certain products may require to ship with dry ice and additional dry ice fee may apply. 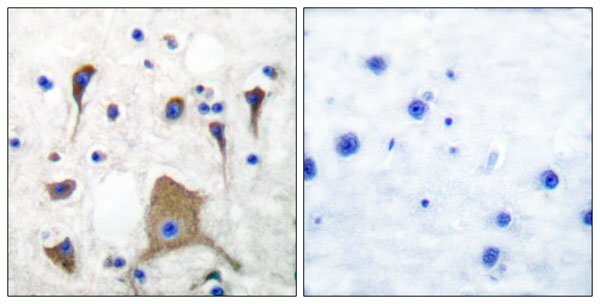 Immunohistochemistry analysis of paraffin-embedded human brain tissue, using GluR5 Antibody. The picture on the right is blocked with the synthesized peptide. Western blot analysis of lysates from mouse brain, using GluR5 Antibody. The lane on the right is blocked with the synthesized peptide. NCBI/Uniprot data below describe general gene information for GluR5. It may not necessarily be applicable to this product. Ionotropic glutamate receptor. L-glutamate acts as an excitatory neurotransmitter at many synapses in the central nervous system. Binding of the excitatory neurotransmitter L-glutamate induces a conformation change, leading to the opening of the cation channel, and thereby converts the chemical signal to an electrical impulse. The receptor then desensitizes rapidly and enters a transient inactive state, characterized by the presence of bound agonist. May be involved in the transmission of light information from the retina to the hypothalamus. 1. DRD2 A2/A1, DRD3 Ser9Gly, DbetaH -1021C>T, OPRM1 A118G and GRIK1 rs2832407C>A are not associated with alcoholism alone or in interaction.